Any architecturally-curious visitor to Downtown Manhattan will probably remember three buff-colored high-rise towers occupying the southern fringes of Central Greenwich Village, just above Houston Street. They are University Village (also known as Silver Towers) - a residential complex designed by James Ingo Freed (I.M.Pei & Associates) and owned by New York University. And they’ve just been landmarked, which protects them from future alterations or modifications. The city’s Landmarks Preservation Commission voted yesterday to give the protected landmark status to the three identical 30-story towers built in 1967 in the Brutalist style. 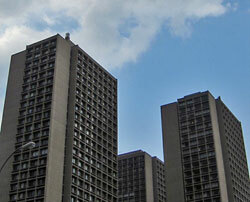 The design of the towers was clearly influenced by Le Corbusier. This happens in the context of a larger tussle involving New York University, the city and Greenwich Village residents. To put it simply, NYU is looking to build more (to the tune of 6 million square feet of space) in already densely built Downtown Manhattan. Specifically, there were discussions of a fourth tower going up: consistent with Le Corbusier’s fundamental principles, the three are pretty liberally spaced. It is widely believed that the university agreed to the protection status in a concession to the locals opposing its expansion plans.